for end of US warfare Thurs, March 19, 2015 "End the Re-Invasion of Iraq-- 12 Years Later"
Thursday, March 19 marks 12 years since the devastating US invasion of Iraq. Peace and Justice Works Iraq Affinity Group (IAG) will hold a visibility action to call for the US to get out once and for all, as troops continue to flow back into the country under the pretext of "fighting ISIS." The action will run from 4:00-6:00 PM that day at the intersection of NE Couch and Martin Luther King Jr Blvd (at the east end of the Burnside Bridge). The IAG's "Tower of Peace" will remind motorists, cyclists and pedestrians heading in three directions about the ongoing effects of US policies in Iraq. 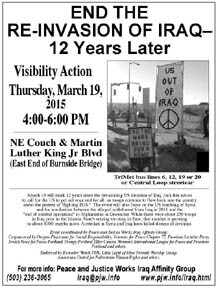 The title of the event is "End the Re-Invasion of Iraq-- 12 Years Later." The event will also focus on the US bombing of Syria, and the similarities between the alleged withdrawal from Iraq in 2011 and the "end of combat operations" in Afghanistan in December. The US continues to operate the world's largest embassy in Baghdad, with thousands of diplomats, "contractors" and military personnel. While there were about 250 troops in Iraq prior to the Islamic State's seizing territory in June, that number has grown to about 3000, maybe more. Airstrikes in Syria and Iraq have killed dozens of civilians (including one strike in Syria in December which apparently killed 50). The US supported the regime of Saddam Hussein during the Iran-Iraq war and then began "Gulf War part 1" in 1991 in part because of Iraq's formidable military capability that they claimed needed to be obliterated. Now, the billions of dollars in military equipment flowing to Iraq (and to Syria's "moderate" rebels) are being acquired by ISIS, perpetuating an endless cycle of war. Meanwhile, basic necessities like food, water,medicine and electricity are still not universally available to Iraqis 24 years since the imposition of sanctions, and internal fighting that did not exist prior to the 2003 invasion kills hundreds each month. One thing making the re-invasion possible is Iraqi Prime Minister Haider al-Abadi granted legal immunity to the US "trainers" now flowing into the country, the sticking point for why combat troops were withdrawn in 2011. Congress recently granted President Obama funds to continue operations against ISIS for three years. Military equipment leaving Afghanistan is being stationed in Kuwait, presumably for another ground invasion of Iraq. The complicated political and military situation includes troops from Iran who are also on the ground fighting alongside the Iraqi government, and Middle Eastern nations who joined US efforts against ISIS in Iraq but are wary of the unstated goals in Syria. Since the US continues to fund, arm and train anti-government rebels there, it's only a matter of time before the airstrikes now aimed at ISIS turn into an Iraq-style "shock and awe" against Bashar Al-Assad. Despite the media drumbeat for another open-ended conflict, a tug-of-war has developed between many in Congress who think the President's Feb. 11 proposal for Authorization for Use of Military Force (AUMF) should repeal the 2001 AUMF put in place after 9/11 and set strict limits on combat versus those who think the plan does not go far enough.-1 While an NBC poll in mid-February showed just 32 percent of Americans opposed to the AUMF,-2 organizers of the demonstration believe that sentiment would be much wider if people were told the AUMF has no geographic boundaries, does not define the ban on "enduring" use of ground troops, and its timetable of three years would likely be extended. Participants are encouraged to use public transit. TriMet bus lines 6, 12, 19 or 20 or the Central Loop streetcar will get you to the site. Event coordinated by Peace and Justice Works Iraq Affinity Group. Cosponsored by Oregon Physicians for Social Responsibility, Veterans for Peace Chapter 72, Freedom Socialist Party, Jewish Voice for Peace-Portland, Occupy Portland Elder Caucus, Women's International League for Peace and Freedom-Portland and others. Endorsed by Recruiter Watch PDX, Little Light of Mine Friends Worship Group, Americans United for Palestinian Human Rights, Portland Peaceful Response Coalition and others. For more information or to get involved contact the Iraq Affinity Group at 503-236-3065 or iraq @ pjw.info. Flyers for the event are available at http://www.pjw.info/iraq_12yl_flyer.pdf.